All About the ALSOPS: Maybe we will end up there??? Maybe we will end up there??? Ok, post number 2 because it is just too hard to not document our times away as a family. Florida was COLDER than normal but of course didn't stop us. 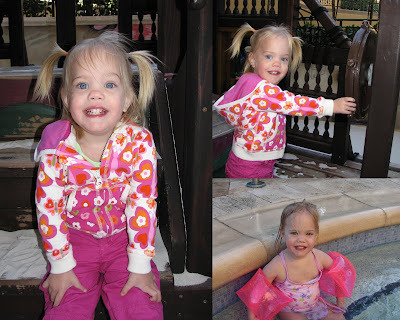 Lexi discovered the hot tub very fast and it quickly became her favorite spot as she would venture back and forth between the pool and top step of the hot tub. (Tiring for me but the girl already has her own agenda and wants to be a big girl like her sister.) She continues to make us laugh and gets more beautiful everyday. We just can't get enough of her. She had a hard time with the sand at the beginning but finally warmed up to the fact that it was ok for her toes to be sandy. She was quite the social butterfly with surrounding guests and was just over joyed to be outside. She has been so pent up at home and watches Kylee leave all the time. Lexi just giggled with excitement every day and couldn't get enough of each experience. Some awesome friends joined us for the end of the trip but unfort unately Dave couldn't make it. Sky was terrific like always watching all the kids so Mel and I could enjoy some girl time. Part of this time was spent teaching them how to find sea glass and with all this training (as you can see) Kylee has become an expert. She now has her own container full at home and our display jar is overflowing. Sky could s pend hours collecting this stuff and I feel proud to have introduced him to it. Oh, and the trip is never complete until they catch a lizard or two and this time even a gecko! Kylee's world now focuses on friends! This kid can't have enough playdates and when she discovered her good friend Zanna (who has moved to NY) was going to spend 4 days in Florida with her she was on countdown mode anticipating her arrival. They had a blast together as you can see, enjoyed being goofy, swimming as much as possible, matching every outfit as best as they could even down to the underwear, and getting all fancy for one of our nights out. I never heard, "what are we doing next mom" the entire time they were there! One Saturday was spent at the Palm Beach Science Center which was an awesome discovery. We spent over 4 hours there and Kylee still would have stayed longer. I was surprised at how many perfect entertaining and educational hands on things there were for her. She still talks about it and wants to go back. I love how eager these young minds are to learn. Is this not the classic picture? We were capturing our own shadows and must have done it over 30 times. One area was the grossology lab where we learned more ab out gas, boogers, burping, barfing...hmmm!?!? 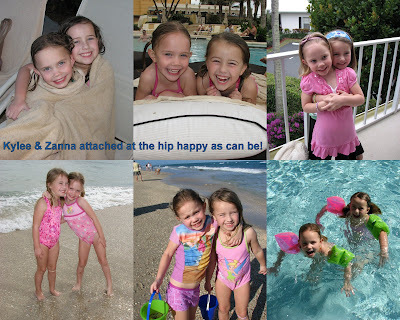 Lastly, I love watching these girls together and am thankful they have each other. Kylee loves taking care of Lexi and is always watching out for her. Oh there are going to be some tough tough times with these two but thank goodness for those priceless moments as well! Florida just puts me in a good...who knows maybe we will end up there. Sky made some awesome connections! cute pictures! the pigtails are darling! and thats fun you got to spend time with your friend too! 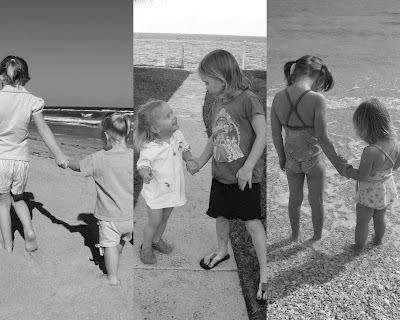 I love the black and white pictures of Kylee and Lexi. They are priceless. I know I am a little more emotional lately, but I just want to keep watching the video and looking at the pictures of your cute girls anticipating that my time to experience some of those joys of being a mom is so close. You got some really darling pictures and it looks like you had a great time. I am so glad. You have a cute family, if I haven't told you that enough yet! I tell ya...so unfair!!! Looks like you had a great time! Love the cute pictures. Wow How fun! I loved the video of Kylee, Laura has the same problem so I can't wait to show her this video. HOpefully it will motivate her for this summer swimming. that is so fun that MEl joined up with you.